Support the work of Progressive HackNight! 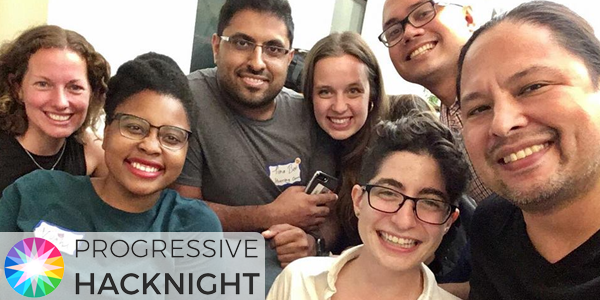 Progressive HackNight is an open community driven by impact. As a community of designers, data enthusiasts, coders, and project managers, we want to use our skills in the tech sector for the benefit of our community, for justice and equality for all. Our community does this by organizing events such as the Progressive HackNight and Progressive HackDay. In these events, we build meaningful relationships, work on impactful projects, and support the work of organizations that are striving towards a more progressive society. The funding we raise will be used to buy great food (pizza!) and drinks to fuel the attendees, and make the hacknight an amazing experience. This will also help the community expand our reach and create a much bigger impact. After donating, a popup will appear and ask if you would like to make it a recurring donation. To become a hacknight sustainer, please choose to make it monthly! Sustaining members will receive awesome swags of thanks from the community and will be considered as a pizza&drinks sponsor in all our upcoming hacknights.